For Part II, covering the valvetrain, exhaust, and cylinder heads: click here. For Part III, covering the block, crankshaft and lubrication systems: click here. To properly fathom the lengthy, thorough and just plain thickly detailed slide show presentation done by the Corvette engineering team yesterday on the all-new LT1 small block V8 would mean you have a degree in mechanical engineering, or are at least some kind of seasoned technician. Sure, the horsepower, fuel economy and compression ratios are simple enough to comprehend, but to wrap one’s head around the sorcery that is the gen V’s “advanced combustion system” is to be adroit with vehicle powertrains. For the sake of simplifying things, if you can’t hold an attention span longer than two paragraphs, here’s what happens: the new process is able to dramatically extract more power from every drop of fuel than ever before. As a result, both horsepower and fuel economy in the 2014 Corvette C7’s new small-block engine are higher than they’ve ever been, with preliminary numbers currently at 450 horsepower/torque, a 6,600-rpm redline, with expectations of exceeding 26 highway miles per gallon. A fantastic power:efficiency ratio, while weighing in at only 465 pounds fully dressed, giving the LT1 an equally impressive power:weight ratio. To compare, a BMW 550i’s 4.4L DOHC twin-turbo V8 is larger, heavier (503 pounds), has a lower compression ratio (10.0:1) and most to GM’s advantage, weaker (400 hp in the 550i) and less efficient (23 hwy mpg). 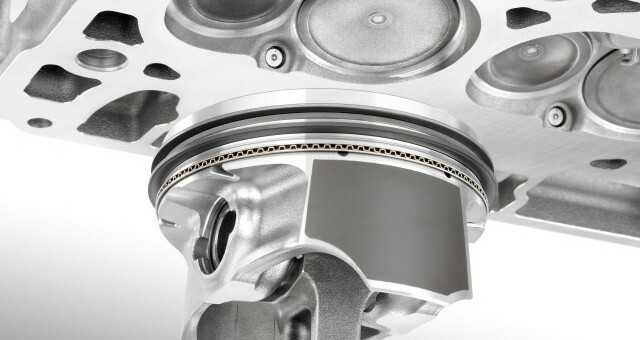 It’s a system that’s been beautifully optimized, thanks largely in part to a revolutionary piston design, as shown above. 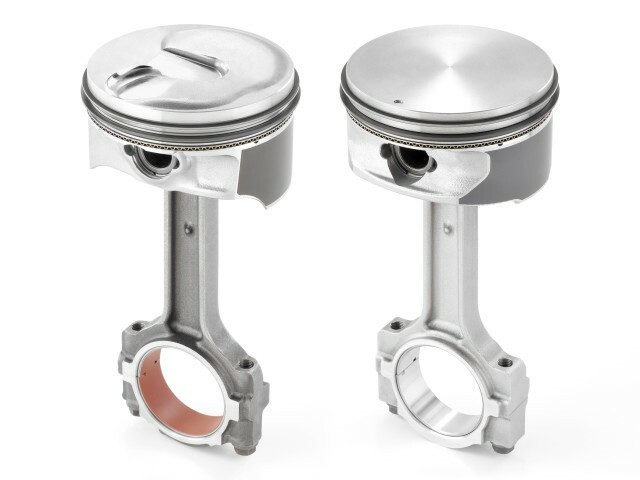 The plain-looking piston on the right is from the outgoing LS3. As the photo reveals, the “bowl” in the middle of the crown on the LT1 piston exists for optimized fuel collection from the direct injection system, and helps keep the cylinder temperature down. Keeping the cylinder cool wards off engine knock, which in turn allows for a higher compression ratio. In the LT1’s case, 11.5:1 — a number which many would have been thought of as inconceivable from an OHV engine just a week ago. Oh, and it needs only 87 octane fuel. Premium gasoline is recommended, not required. Meanwhile, the bulging crescent on top of the cylinder head also aids in achieving the awesome compression ratio, while the relief near the edge optimizes cam phasing. Completing the package are piston cooling oil jets, forged connecting rods, and LS3-style ring packs, style casts and drilled oil drains. Of course, the piston is only part of the story. Active Fuel Management (AFM), which shuts down the LT1’s firing cylinders from eight to four by disabling the valves to the cylinders, also brings the efficiency of the 6.2L pushrod motor to never-before-seen heights. When AFM commences, the engine turns the 6.2L V8 into a 3.1L V4, shutting down cylinders 1, 4, 6 and 7, and firing only cylinders 8, 2, 5 and 3 in that order. Otherwise, the complete firing order is 1, 8, 7, 2, 6, 5, 4, 3. Here’s something counter-intuitive, and probably will answer the questions as to why the LT1 is a 6.2-liter engine, and not something like 5.5-liters. It’s because smaller displacements would reduce the amount of time the engine can operate in 4-cylinder mode, which would mean the engine would be more thirsty for gasoline. Therefore, a bigger displacement is needed for the sake of increased fuel economy. Some of you may also be wondering as to why GM insists on carrying on the two-valve-per-cylinder approach. Yes, the LT1 still only features two valves per cylinder, which on paper seems archaic. But that’s part of the small-block alchemy: simplification that achieves superior or equal performance compared to more complicated engines (read: DOHC V8 mills). By spreading out the single intake and exhaust valves for every cylinder, it reduces shrouding and enables greater airflow into the engine, while pushing the exhaust gasses outward more efficiently. Also, the intake and exhaust valves sit opposite of where they were in the LS3, sitting in a reverse order. Altogether, it optimizes interaction for the most power and efficiency, based on computational fluid dynamics testing (CFD). CFD consists of computer simulations that uses applied algorithms to accurately create certain scenarios to find the desired outcome. There were over six million hours of CPU time dedicated to the combustion system alone. Notably, over 75 iterations of combustion systems for the fifth-generation small-block were developed and evaluated through computational analysis, before a final design was selected. 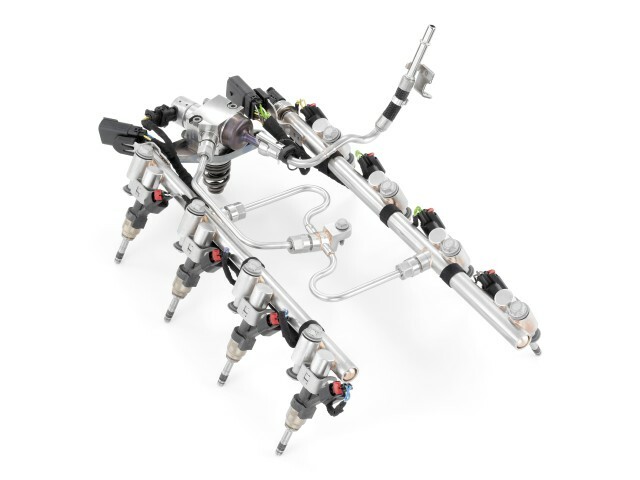 This new system was also necessary for the application of direct injection. As Corvette executive chief engineer Tadge Juechter proclaimed: “it’s not like some sort of bolt-on”. Another challenge here was that they couldn’t just carry over or modify the blueprints of direct injection systems on GM’s smaller engines. This is because the overhead valve arrangement and two-valves-per-cylinder arrangement was completely different than the DOHC design of GM’s other direct-injected engines. The motion of the air/fuel mixture (also known as the “flow field”) is more complex with an overhead-valve (OHV) design and, adding direct injection requires more mixture swirling for optimal combustion. Adding direct injection also called for the spark plugs to move closer to the center of the combustion chamber this time around in order to optimize the direct injection system. The direct injection system is well-hidden, underneath the intake manifold, while the fuel injectors themselves are underneath the intake ports. As we have seen in the 3.6L V6 engine, direct injection can greatly increase performance and efficiency by spraying fuel directly into the combustion chamber. But it adds a sort of unwanted ticking sound that deters from the purr of the engine. However, Corvette engineers unanimously ensured everyone that such a noise has been subdued in the LT1. Why do all of this? Possibly to prove the point that a V8 doesn’t need to have dual overhead camshafts to be relevant today. But… if GM were to someday once again apply a DOHC setup on a V8, with this new combustion system… everyone else might as well give up. Next story This Is The Chevy Sonic Dusk, And It Is Going To Be Produced! I hope they have the dreaded “piston slap” figured out and it will not reappear on these new engines. Piston slap has been addressed since Gen IV, when full floating bushings were introduced. That is one huge valve. What is the diameter? Intake valve is 54 mm, one mm smaller than the ones in the LS3. Currently putting together the next piece covering the cylinder heads, cams and valvetrain. Then it’s intake and exhaust manifolds! Then it’s the block itself, crank, and lubrication systems. What do you guys think of this article? Was it more helpful than you’ve been reading from other outlets? I’d say it was. A fully dressed LT1 weighing 465 lbs in compairson to the 550i’s TT 4.4L that weights 503 lbs…. I mean I know the stereotype of “big lazy slow american engines” that gets thrown around on forums all over the internet, but I know how small the small block is, and how something that says 6.2L on the cover need not fill the engine bay…..or weigh so damn much. all of this info is great, I don’t believe any other automaker gives out this much detail. Although I enjoy reading about it, I’m surprised they don’t leave more for their competitors to figure out on their own. Wouldn’t take much for say, a Ford engineer, to be given this engine and figure everything out. With laser imaging they could have every part scanned pretty quick. I found it to be a good read, both Part I and II. I would love to see all the technical details discussed at the event. Basically flipping off the other boys with their fancy plasma coating. I’ve never heard that they use whp.. I have heard that they underrate figures though. If they released whp only, then the F10 engine in the M5 would be making 645hp? The 2.0 in the 3 series would be developing 275? Drive train loss has typically been 15-18%. With the fancy new transmission, maybe, that loss is 12-15% now. The 328 has a higher axle ratio, and depending on gear ratios that could be all that is needed to say why the 3 series is faster. Virtually all manufacturers now advertise HP determined by SAEJ2723. This is the same test run since the early 70’s EXCEPT it is run at an SAE certified test site and witnessed by an SAE approved third party. This procedure measures HP at the flywheel and the engine must be fully dressed with all production parts. I do not understand why BMW does not use this procedure but they do have a standard DIN procedure which also measures at the flywheel. Boo…to cylinder deactivation …. torque drops and it will feel anemic when driving; just like my Tahoe! I thought this was a pretty cool video on the new LT1. I’m really impressed with the new tech on this motor. A huge amount of potential for HP and FE! Looking forward to the next section , Manoli!! Nice read but for all the engineering that went into it I’m not that impressed. Don’t get me wrong, it’s a nice motor and a lot better than the l98 TPI in my Vette but it is only 20 more HP than the LS3, as rated. You compare to the BMW but what about the Boss 302 that is here and now, never mind 2014, with 444 HP as rated with ONLY 5.0l displacement?! Does anyone notice the 3.6l LFX @ 323 HP does more with less? If you add only 2 more cylinders to the LFX = 4.8l you’d have 430 HP! IF you need to increase displacement for your AFM, you’d have OVER 450HP as rated. Remember, HP is just one aspect. And I’d bet my dreadful 2007 Mazda6S that just sits in my driveway, that it will produce at least 470hp for the base C7, EPA 30mpg hwy in a 6spd auto/manny might not even be a stretch, when they are get the 8-auto 31-32mpg. City mpg COULD be 20mpg. The base C7, with 470hp, and it’s overall lower curb weight, could give the C6 Z06 (no Z07 or track pack goodies) some competition. Not saying it would track faster, but certainly nip on it’s tail. Sorry andrew, I don’t see 470HP stated in the article but did see 450HP which is rated. The LS3 is 430HP so it really isn’t that big a deal and if your buying a C7, your not as worried about MPG as when you bought your mazda. Yes, any MPG improvement is more than welcome but is it REALLY going to be that much better than what they get now? No offense but my point really is based on the more for less of the 3.6l LFX who’s technology exists today and the C7’s main competitor, Ford’s Boss 5.0l which also does more with less (this being based on displacement), never mind the BMW’s. Sure wouldn’t want to buy a new C7 and get spanked by a Ford, any Ford, lol.. I also wonder how much this improved engine is going to add to the C7’s bottom line price tag. New and improved is nice but at what cost and what do you actually get in the HP and the MPG? I wasn’t worried about MPG with my Mazda, it’s my winter beater, my CTS that has 70 more HP yields better fuel efficiency. The Corvette isn’t priced so high that fuel econ. figures don’t matter to the consumer. If that were the case GM wouldn’t have gone to such extensive lengths to get the engine so efficient. The same could be said for full-size truck power plants, but that isn’t true either. I’d say a 3mpg improvement does matter and is pretty substantial, especially in a sports car that tons of people use as daily drivers. Line up a C7 with a GT500 and the GT500 with trounce the Vette. But just as the ZL1 has showed, lower power with superior chassis can dominate the Ferd brute around a track, while also being more liveable as a daily driver. I doubt prices on the Vette will increase much (less than $2k), but as you pointed out, if you’re buying a vette you don’t care about money spent on gas, so what’s a little generation inflation. GM Authority has explained why the displacement is what it is, for the longest time I figured it would go down to the C6R size of 5.5L while still showing a power increase over the gen4 6.2L. The Boss 302 is a DOHC engine, vs the LT1 OHV pushrod. I can explain further in regards to the displacement argument, but I think GMA covered that in either this article or the Part2, though I can go more in depth. I have been trying to reach someone at GM to discuss technical questions I have regarding this new LT1 engine prior to a purchase. GM has no provision to discuss anything with anyone – so far as I can tell. Even calling the GM corporate customer service representative did not reveal any means to pre-sales support. I have been told to contact their resellers for technical information but those guys only know part numbers and pricing info. They refer me to the GM Performance Parts catalog, which does not answer very basic questions regarding the adaptability of this product for older vehicles. This engine is a very expensive toy, which according to GM, has been specifically designed and engineered to service the aftermarket for repowering older vehicles. However, unlike any other manufacturer of technologically advanced products, they offer their customers no avenue by which to confirm application details. That is arrogant and counterproductive to their purposes from a marketing stance. My main issue has to do with the fact that they only offer a serpentine accessory kit, which is what is found in the new Corvettes. Those cars do not however have a hydraulic power steering pump, as they have electric steering systems, which cannot be retrofitted to older cars. Why on earth would they say that they are intending this product for the aftermarket, yet leave such a basic matter unaddressed? To further complicate the matter, this serpentine kit employs the use of a double sided ribbed belt in order to eliminate idler pulleys. If one were able to custom bracket a power steering pump onto this engine, it would be difficult – if not impossible to find a belt that would work for that application. I remain unable to order this engine until this detail is worked out.